The Rooftops Baby Estimated Due Date: How Am I Today? Today is my/the baby's estimated due date. I know this because it says so in my calendar and my maternity notes but I've tried not to focus on this one specific day and, for the most part, I've succeeded. They're called estimated due dates for a reason. Only 5% of babies arrive on their due date and the majority of first babies come later. If it arrives of its own accord within the next two weeks, it's still within the normal, healthy delivery window; I don't want to spend those two weeks getting myself worked up by referring to the baby as "late". I seem to be in the minority with this view, though. The number of "Hey... how are you today...?" messages I'm getting suggests that a lot of the people in my life are viewing this as some sort of deadline. So, okay: let's give it a little significance. I know I'm supposed to be at the end of my tether by now. I know I'm supposed to be mainlining red leaf tea and eating so much pineapple my teeth fall out. 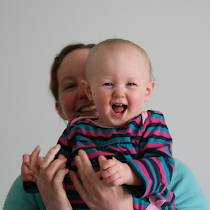 I suspect if I'd worked right up until my maternity leave started, perhaps I would be - I would be much more focused on the end being in sight; I would be much more aware of not wanting to waste my precious time off work. But, for the most part, I'm not. There are bad days. There are days when the baby moves itself onto some vital part of my internal plumbing and I feel so uncomfortable that I want to call the hospital in tears and demand that they remove it. Those days are the exception, though; they're maybe one in ten. And there are moments - mostly in the evening, when Steve's home and we're feeling the kicks together - when I feel this desperate, overwhelming need to hold the baby now. But, over all, I'm calm. Partly this is because I still don't really believe it's going to happen. My body, suddenly going through all of that physical drama and producing a baby at the end? Preposterous. Ludicrous. Totally implausible. I mean, sure, Steve and I are going to have a child pretty soon but it's coming one of the old fashioned ways: stork or cabbage patch. It's in transit right now. I'm waiting for the doorbell. Partly it's because I've been pregnant so long that I've accepted this as my default state. I'm someone who waddles around and has trouble getting out of bed and eats a lot of ice cream. I forget that this isn't forever. But mostly it's because I'm actually enjoying these last few days or weeks. I may not be comfortable but I'm very aware that, once the baby's here, I will never again be pregnant with this particular child (I may never again be pregnant at all but that's too big a question for today). I'm taking the time to sit and feel the baby's squirms and rolls and stretches; I'm feeling it moving itself into position. This child has strong movements and rarely rests - I could let myself focus on how bruised my belly feels but I'm choosing not to; I'm choosing to focus on this secret, super-connected time we have. It's special. It's fleeting. And I'm enjoying these last excited moments, holding Steve's hand and grinning at each other. With this pregnancy, we both found ourselves reining in our emotions - I didn't properly relax until the twenty week scan, until I knew for certain that all those movements I was feeling were kicks not wind; Steve seemed to take longer. But now there's no holding it back. It's funny - there's so little company I can take at the moment. A couple of hours and a cup of tea with a friend is lovely but, for the most part, I want to be on my own. I want quiet. I want to breathe through the discomfort without feeling self-conscious; I want to move from chair to yoga ball to bed and back at my own pace. I don't feel the need to have anyone on hand. Except Steve. I want Steve here all the time; I feel impatient towards the end of the day, waiting for him to appear. I want him around sharing it all with me. There may be one more hour of this; there may be two more weeks. Two weeks, compared to the whole pregnancy, is nothing. I don't want to waste them on drumming my fingers; I want to appreciate the moment. See Also: My 20 week, 30 week and full term FAQs. This is lovely (and hooray for feeling great!). And yep, definitely a stork delivery coming up, nothing too messy or painful, oh no. Glad to hear you're doing well! I have to admit, in a way that's not really creepy but sort of sounds creepy, that part of the reason I've remembered to check my blog feed reader recently is to see if you've had your baby. Is that weird? (I promise I'm not stalking you.) Sending many good thoughts your way! Ha ha - it's not the mess or the pain; I just don't seem to believe in labour. It seems such an inefficient way of reproducing. The joys of the delivery window, Ciaran was bang on his due date (which is awesome as he was our 666 baby!!) and Aaron was 8 days after he was meant to join us. Your little one will join you when he/she is ready to, enjoy these last few moments as things will never be like that again!! My not-being-pregnant focus is, "Ooh! I'll be able to moisturise my feet again!" Something in my brain really hasn't connected this huge bump to a life changing event yet! Steve came on his due date. I know, right?! Yay! If there's one thing we can't regulate, it's this. Yep, they know when they're ready, right?